Even though you may not sell for many years to come, the choices you make and the way you operate your business today will determine what you’ll get for you business when the time comes. Before we jump into the specific steps you can take, some context will help clarify why these steps are your top priority. The buyer may want your business because they believe they can increase its profitability. As such, it can be tempting for you to ask for a purchase price that recognizes the unrealized potential or upside of the business. However, it’s unlikely that the acquirer will find financing to fit this type of purchase price. This is because the bulk of the money that will fund the acquisition will likely come in the form of a loan – not from the acquirer’s own pocket. Most small business lenders won’t often give an acquirer credit for their plans to increase profitability. They are more likely to give the acquirer a loan for 75-85% of a purchase price that’s driven primarily by the cash flow that it can reliably generate already. With this in mind, here’s what you can do to put yourself in the best possible position to sell profitably. Diversify your revenue: The more confidence that acquirers and lenders gain that your revenue will remain stable, the higher your sales price will be. As such, years before you begin actively trying to sell, you should do whatever you can to prevent your business from being dragged down if one particular client walks away. You don’t want your business to depend on one or two accounts. This would make your business look riskier to acquirers and lenders and hamper your sale price. Safeguard your revenue: Securing and protecting your existing revenue sources is more important to the profitability of a sale than your business’s ability to innovate and launch new products. Similarly, design your products and services to be inherently valuable or “sticky” to your customers, even if you and other key executive walk away from the business. Focus on how you can make your revenue as reliable as possible. A dollar of revenue that will recur is worth more than a dollar from a revenue source that may disappear. Secure key personnel: The liquidity of your business – i.e., your ability to sell it profitably – will largely hinge on the stability of the cash flows it generates. If most of your key executive and middle management are set to leave upon the sale of your business, however, lenders will have less confidence in financing the acquirer’s purchase of your business. Suddenly, the key to your retirement may fall out from under you. Make yourself dispensable: You read that right. As you have grown your business, you have played a key role in forming the strategy, getting the business off the ground and making key decisions along the way. 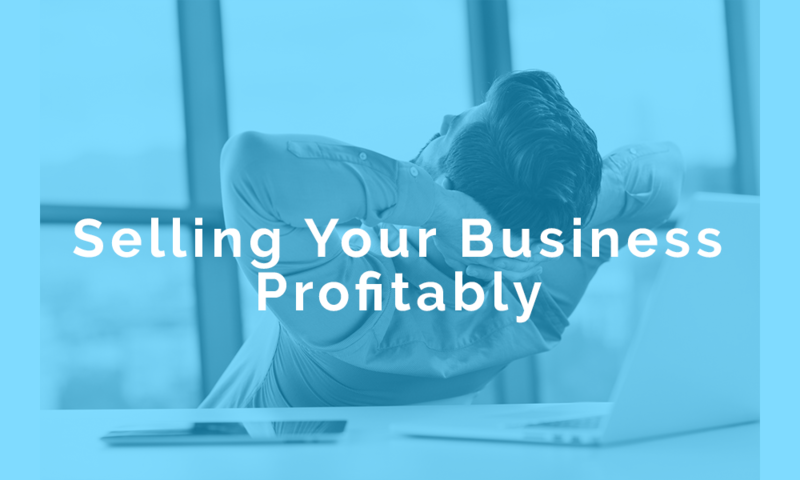 If you are to sell profitably, however, it’s important that your business be able to make a profit going forward without your help in particular. If revenue depends on your personal relationships or capabilities or on the willingness of just a couple of accounts to stick around, your earnings will be more heavily discounted in the purchase price calculation. Build a business that can thrive without you. Manage your costs. It can be easy for expenditures to spiral out of control if not regularly and rigorously assessed. Be able to explain how every dollar you spend ultimately contributes to your bottom line and your business’s long-term health. Budgeting effectively will support your sales price. Maintain the quality of your assets. Make sure you’ve taken all practical steps to ensure the quality of your physical assets – like equipment, inventory and real estate – as well as your intangible assets – like intellectual property and brand recognition. You can bet that any prospective buyer with a head on his or her shoulders will carefully diligence your assets and that their findings will shape their offer. They wouldn’t want to take over your business and need to outlay a significant amount of cash on Capital Expenditures on day 1. Select debt financing options carefully. Rushing into expensive loans will not only squeeze the amount of money you can contribute to building your business, but also reduce the attractiveness of your business for prospective buyers. If you find yourself with burdensome debt, consider how you can refinance debt to cut loan servicing costs. The reality is that some elements of the sale process will be out of your control. If the economy were to turn south, for example, the market for acquisitions might sour across the board – putting you and every other seller in a challenging position. The presence of elements outside of your control make it all the more important that you do the best you can with those elements that you do control. So have at it. And if you found this article helpful, please share!